Coloured copper engraving, engraved by Kip after Leonard Knyff, published 1724. 14 x 19". From Kip's Johannes Kip’s monumental topographical work, Le Nouveau Theatre de la Grande Bretagne. The early eighteenth century in England was dominated by the work of a group of Dutch artists and engravers who came to live and work in London. It was in 1707 that David Mortier offered for sale the first series of large volumes of topographical engravings of English towns and estates initially under the collective name of Britannia Illustrata (1707) and later, from 1715 onwards, Le Nouveau Theatre de la Grande Bretagne. Kip engraved the majority of the plates for this work either after his own designs or after the drawings of his fellow Dutchman, Leonard Knyff. Perhaps most famous and beloved of all are his aerial views of English country houses and estates where each plate depicts a country seat surrounded by formal gardens and farmland. The name of the landlord is emblazoned across the plate within a decorative banner and accompanied by the appropriate coat of arms. 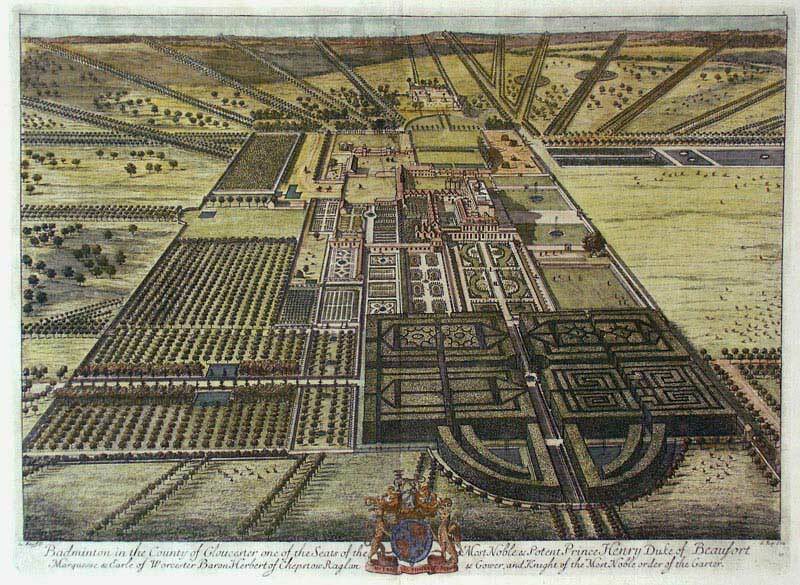 Many of the houses and gardens are pictured in their seventeenth century state before the great remodelling and landscaping of the mid eighteenth century. The work therefore provides an invaluable historical resource and is one of the most comprehensive and decorative topographical studies attempted in the eighteenth century.